Kojika’s Home | Kagoshima Shochu Kojika || KOJIKA SHUZO CO., LTD.
Ōsumi Peninsula, where Kojika Shuzo resides is in the southeast region of Kagoshima prefecture. The northeast borders on Miyazaki prefecture, its west faces Kinko Bay and the southeast faces the Pacific. The Pacific coast region is designated as Nichinan Kaigan Quasi-National Park, including scenic site Cape Sata and is blessed with rich nature and the warm weather. Mt. Kunimi, Mt. Kurosondake, and Mt. Hoyoshidake are acquainted as Santake (meaning 3 mountains). The Kunimi (Kimotsuki) mountains that spread to the southeast part of Ōsumi Peninsula are full of grandeur with a beautiful laurel forest zone. The Takakuma mountain range at the northwest has a series of mountains over 1,000 m (3,281 ft) including Mt. Ontake and Mt. Onogaradake. Kanoya-shi, where Kojika Shuzo is located, at just about the center of Ōsumi Peninsula has a population of about 100,000 and is the hub of the administration, economy, and industry. The climate is warm with an annual mean temperature of 17°C (63°F) and rainfall around 2,000 ml (98 in). Kanoya-shi Aira-cho, where Kojika Shuzo resides, is also home to one of the Kamisansanryou*, Airasanryou. The name Aira traces back to the second volume of Nihon Shoki (720 A.D.) which is one of the oldest official Japanese historical books consisting of 30 volumes. * 3 sacred mountains believed by some to be the tomb of certain Japanese gods. The pronunciation of Kanoya is similar to Kaya and thus thought to be a possible origin for the name. Kaya refers to the group leader Kaya of Kumaso, which is in Kojiki and Nihon Shoki. The kanji for the plant chigaya may also be read as kaya, which has a similar pronunciation to Kanoya. The name Kanoya could mean “home of deer”, which were plentiful in the area. We started out as Kojika Shuzo Cooperative Partnership based on the fact that it was a brewery opened by small shochu brewers in Kagoshima’s Kanoya area. Ōsumi Peninsula is the number one producer of Satsuma imo in Japan, producing high quality sweet potatoes. 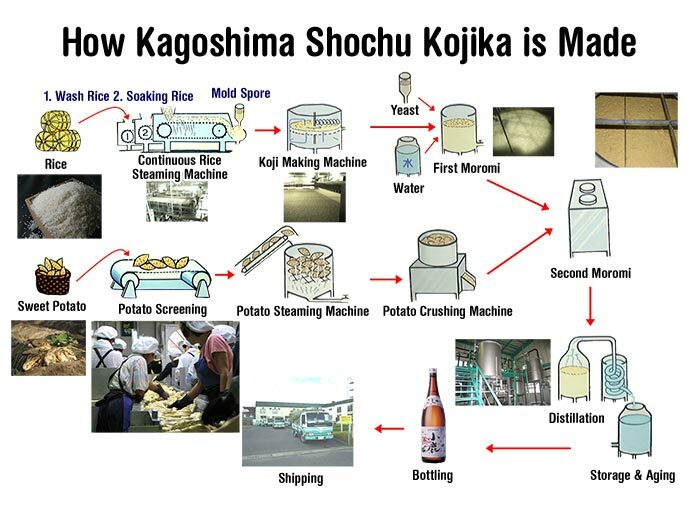 In order to stabilize the supply of fresh potatoes, Kojika Shuzo established Kojika Agricultural Co-Operative. From the planting in Spring to the harvest we coordinate a direct management farm of approx. 30ha (3,229,170 sq ft) and a contract farm approx of 100 ha (10,763,900 sq ft).